GERA attended the Planning Zones Forum held earlier today (refer below) and congratulates L.A.R.G.E. for presenting an informative and well attended forum. Details of the presentations and question/answer session will be published on L.A.R.G.E.’s website later this week. GERA has been in contact with a new residents group, L.A.R.G.E. (Lobbying and Advocating for Residents of Glen Eira) advising a Community Forum to be held this coming Sunday (15th September, 2013). In line with GERA’s mission of “encouraging resident participation in the consultation and decision making processes of the City of Glen Eira”, we welcome and support this new group. 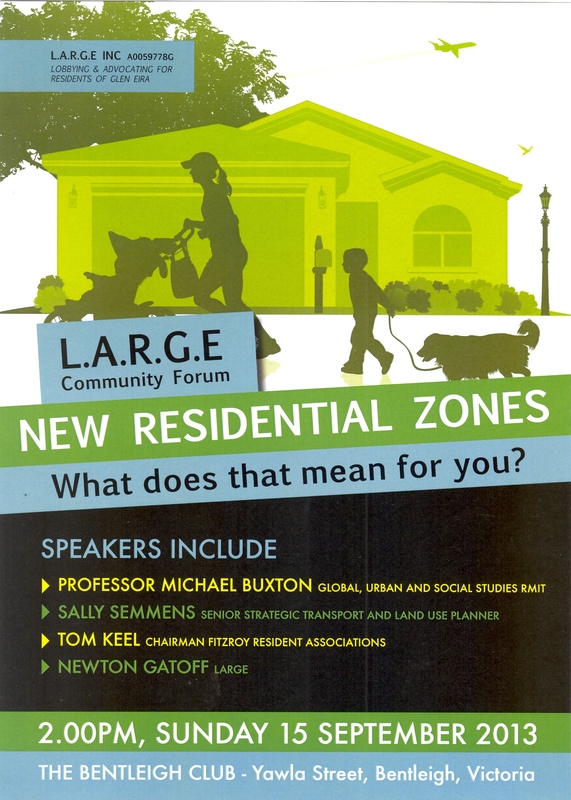 We encourage residents to attend the forum to learn of the implications of the new zones.